I am currently working on a book project tentatively entitled, Looking Through the Speculum: Feminist Health, 1969-2010. In this manuscript, I focus on an interrelated set of ideas, practices, and institutions. The women’s health movement was founded on a few guiding principles. Most significantly, the women of the movement believed that women should retake or retain control of their healthy bodies rather than turning them over to physicians. Further, they believed that women should see themselves and other women as critical resources for building a feminist knowledge base centered on women’s embodied experience. Finally, they identified organized medicine as one of many institutions that sought to control women by controlling their bodies and the information about those bodies. Health feminists enacted these beliefs through a variety of feminist practices. This book concentrates on three: cervical self-exam and self-help gynecology; feminist healthcare provision including abortion; and feminist research and knowledge creation. Finally, this book examines how these principles and practices were instantiated in feminist institutions–women’s health clinics. Part of this work, “The Best Prescription for Women’s Health: Feminist Approaches to Well-Woman Care,” was recently published in Prescribed: Writing, Filling, Using, and Abusing the Prescription in Modern America, eds. Jeremy A. Greene and Elizabeth Siegel Watkins (Johns Hopkins University Press, 2012). See also “Lesbian Health Matters: The History of An Evolving Concept” for International Encyclopedia of Social and Behavioral Sciences, 2015. In 2012, I became the book review editor of the Journal of the History of Medicine and Allied Sciences. I am now its associate editor. I am on leave 2017-18. 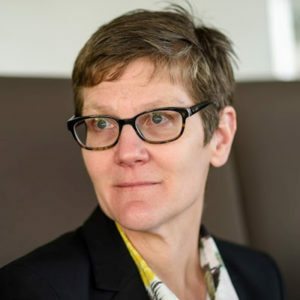 Judith A. Houck. 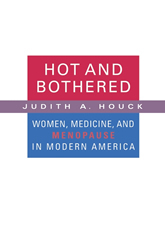 Hot and Bothered: Women, Medicine, and Menopause in Modern America. Harvard University Press, 2008. “The Best Prescription for Women’s Health: Feminist Approaches to Well-Woman Care” section in Jeremy A. Greene and Elizabeth Siegel Watkins, eds., Prescribed: Writing, Filling, Using, and Abusing the Prescription in Modern America (Johns Hopkins University Press, 2012). “The Medicalization of Menopause in America, 1897-2000: Mapping the Terrain” section in Daniel Lee Kleinman, Abby J. Kinchy, and Jo Handelsman, eds., Controversies in Science and Technology Volume 1: From Maize to Menopause (Wisconsin University Press, 2005). “‘What Do These Women Want?’ Feminist Responses to Feminine Forever,” Bulletin of the History of Medicine 77 (2003), 103-132. “How to Treat a Menopausal Woman: A History, 1900-2000,” Current Woman’s Health Reports 2 (2002), 349-355.